It’s a wooden block with evenly spaced holes. 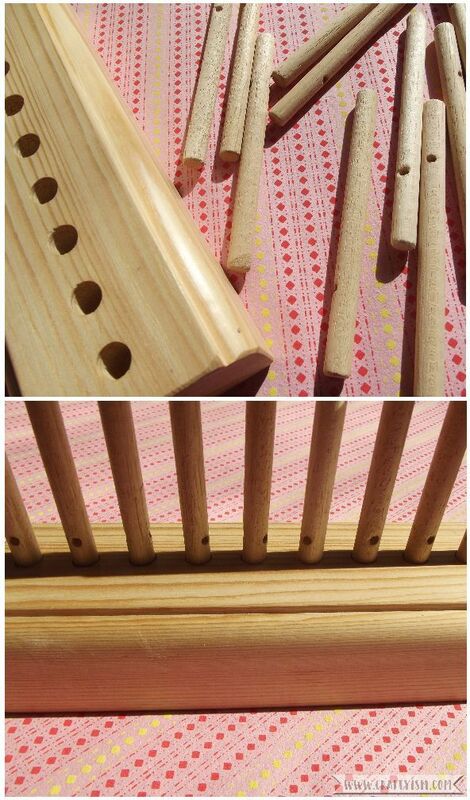 In the holes fit wooden pegs which have holes through the middle of them. Each peg is threaded with a warp thread. A weft thread is woven in and out between the pegs which begins to create a woven fabric. 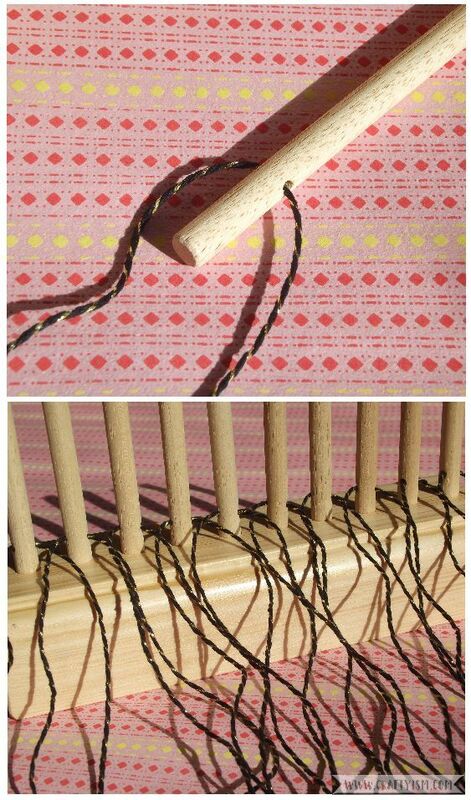 Basically a peg loom is a way to create your own fabrics and woven pieces. My loom has 10 pegs which makes a fabric about 17cm wide. The more pegs your loom has, the wider fabric you can loom. The first step is to set up your pegs with a warp thread. I’ve used a black and gold string as I thought it would be quite strong. Cut equal lengths of the string and pass an individual string through each peg. Place the peg in a hole in the block of wood, and pull the end of the strings so that they’re at the same level. Repeat with all the pegs making sure that all the strings are roughly the same length. The wool that you weave with will be pushed down these threads and tied at the ends. So it’s important to make sure that your warp threads are the right length for the fabric you want to weave. I bought a skein of rare breeds wool that I’d been saving for a special occasion which I decided to use as the weft thread. The weft thread is the one that gets woven around the pegs and pushed down onto the warp string. To start the weaving, tie the end of the wool onto the last peg on the right. Make sure it’s tied just above the hole which the warp string is threaded through. Using the wool and starting from the right peg, weave the wool in between the pegs. When you get to the last peg on the left, take the wool around the peg and continue weaving. This second pass will be opposite to the direction you wove on the first go. Keep going like this, pushing the wool down as you go, to create a solid block of weaving. When you have a block of weaving about 2inches high, it’s time to move the fabric down the warp threads. 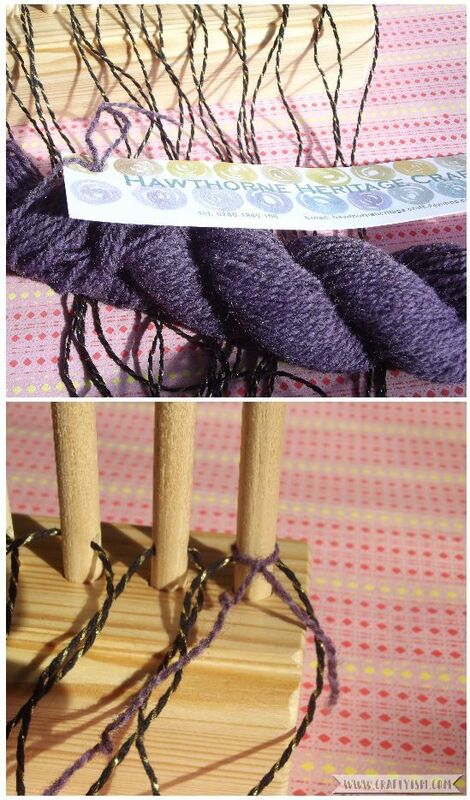 To do this, make sure that your wool is at the last peg on the right. Carefully pull this peg out of its hole and up through the woven fabric. Replace the peg back in its hole and repeat this with all the other pegs until the weaving is completely off the pegs. Repeat steps 3 and 4, pushing the weaving together as it goes down the warp threads. Keep going until you have run out of wool, or the weaving is as long as you want. Tie the end of the wool onto the wool thread below it to secure. When you’ve finished, pull the weaving down the warp threads so that you can cut the warp threads at the peg hole, leaving the threads long enough to tie. To stop the weaving from unravelling, the warp threads need to be tied. Start at the bottom of the weaving with the warp thread at the far left side. Tie this thread to the one next to it (thread 2) Tie thread 2 to the one next to it (thread 3) and so on. Once you have reached the end and got to the thread on the far right, repeat the process, this time going from right to left. The threads have now been knotted twice and the excess can be cut, or left long as a decoration. Repeat the knots on the other side of the weaving to secure that end. 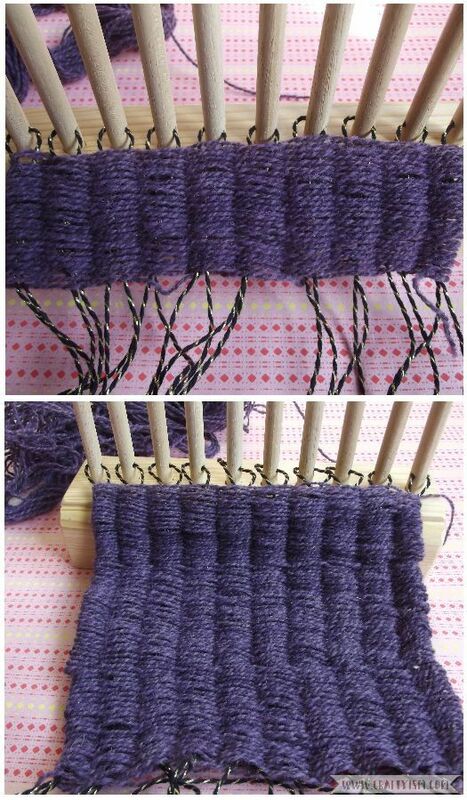 I’m so surprised at how easy the peg loom was to use and how quickly the weaving worked up. My 10 peg loom and 25g or wool made a finished weaving of 28x17cm. It’s quite thick but still very flexible and I think I’ll use it as a little place mat. A larger peg loom would make brilliant rugs or cushions and you could use super chunky wool or even cut up t-shirts. 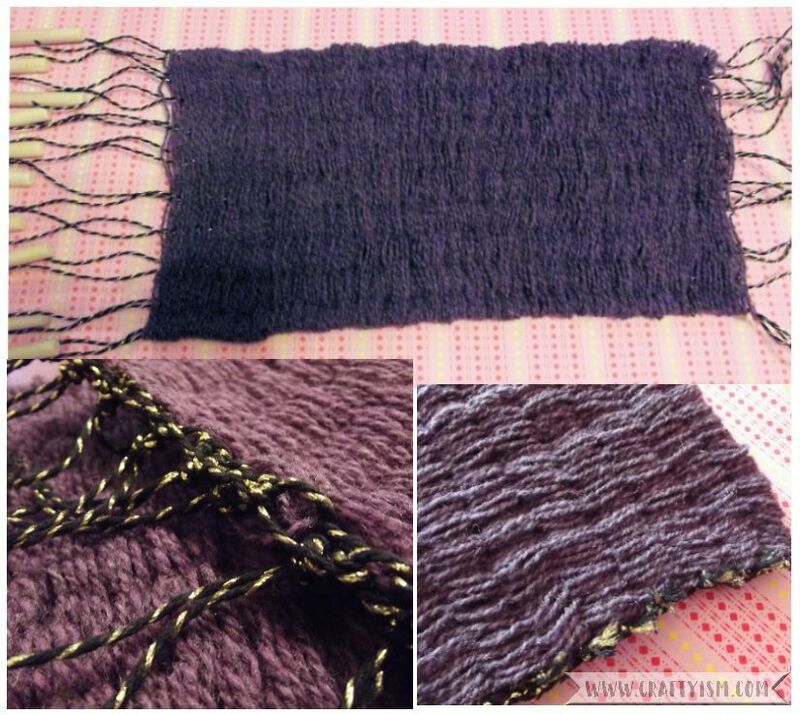 I know that this is the very basics of peg looming and that you can get really fancy with patterns and finishing. If you have any tips, please let me know as this is a craft that I think I’ll be trying again!